The global d-mannose market has witnessed growth over the last few years due to growing awareness about its role in UTI prevention and treatment. The presence of widespread population demographics suffering from UTI has led to several companies attempting to innovate d-mannose products as per the local taste and raw materials present in the region. According to Transparency Market Research, revenue generated from the global d-mannose market is estimated to be US$700 mn by the end of 2017 and is expected to increase at a CAGR of 3.5% over the 2017-2025 forecast period. The global d-mannose market is thus expected to be valued at approximately US$1 bn by the end of 2025. The global d-mannose market is segmented by product type into capsules, powder, and tablets. Capsules are likely to remain the dominant contributor to the global d-mannose market in the coming years. The capsules segment is likely to consistently account for more than 50% of the global d-mannose market though the 2017-2025 forecast period and reach a valuation of US$561.1 mn by the end of 2025. The growth of the capsules segment through the forecast period also represents the highest CAGR of all product segments of the global d-mannose market, with the segment likely to exhibit a steady 4% CAGR. Human consumption is likely to be the dominant application segment of the global D-mannose market. The key boost to the growth of the global d-mannose market is the growing recognition of its utility as a natural alternative to antibiotics for prevention and treatment of urinary tract infections. The growing prevalence of antibiotic resistance with regard to several key pathogens has thus been helpful for alternatives such as the global d-mannose market. On the basis of region, the d-mannose market in North America and Europe is expected to dominate global figures over the forecast period, followed by Asia Pacific. Increase in the number of local players in Asia Pacific is anticipated to entail higher procurement of d-mannose products in the region. Asia Pacific is expected to become a prominent player in the global d-mannose market by the end of the forecast period, with the region’s significant CAGR attributed to the steady growth of the nutraceuticals and animal feed industries in the region. 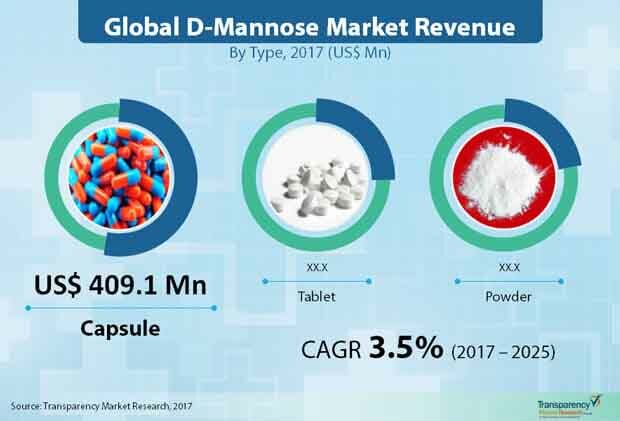 Some of the major companies operating in the Global d-mannose market are VWR Corporation, Atrium Innovations Inc, Ferro Pfanstiehl Laboratories, Inc, Now Health Group Incorporation, Hänseler AG, Kyowa Hakko Kirin Co Ltd, E. I. du Pont de Nemours and Company, Bio-Tech Pharmacal Inc, Jarrow Formulas Inc., and Nutraceutical International Corporation. Several well-established companies operating in the d-mannose market, such as Now Health Group Inc., Nutraceutical International Corp., E. I. du Pont de Nemours and Company, and Jarrow Formulas Inc., have placed central focus on expansion of their manufacturing facilities, while attempting to acquire local players in developing markets. Transparency Market Research offer 8-year forecast for the global D-Mannose market between 2017 and 2025. The global D-MANNOSE market is expected to register a CAGR of 3.5% during the forecast period. The primary objective of the report is to offer insights on the advancements and opportunity in the D-Mannose market. The study demonstrates market dynamics that are expected to influence the current challenges and future status of the global D-Mannose market over the forecast period. This report also offer updates on trends, drivers, restraints, value forecasts, and opportunities for manufacturers operating in the global and regional D-Mannose market. D-Mannose is a simple six-carbon sugar and a stereoisomer of glucose and naturally occurs as a monosaccharide (simple sugar) in fruits such as blueberries and cranberries, as well as in other plants and fungi. Mannose may aid in maintaining and supporting a healthy urinary tract by blocking adhesion of foreign particles to the surface of the host tissue. Also, the ability of mannose to get absorbed in the upper gastrointestinal tract and not getting converted into glycogen for storage is a factor that is leading to increasing popularity of D-mannose as an effective prebiotic agent. By finished product type, the market is segmented into powder, tablet and capsule, by application, the market is segmented into dietary supplement, functional food, pharmaceuticals, animal feed and others, by distribution channel, the market is segmented into direct and indirect. According to the study conducted, the capsule is dominant over powder as well as tablet owing to consumer convenience and relatively better absorption. In application segment, dietary supplement is anticipated to dominate over the forecast period on the backdrop of the growing trend of people opting for natural, and non-GMO products. Moreover, the indirect distribution channel is expected to account for most of the market share in this segment due to the increasing utilization of D-mannose as a finished product. The report includes market share of each segment according to the region with analysis towards market trends respectively. A section of the report highlights D-Mannose demand. It also provides a market outlook for 2017–2025 and sets the forecast within the context of the D-Mannose ecosystem, including the new product developments as well as product offerings in the global D-Mannose market. This study discusses key trends contributing to growth of the global D-Mannose market, as well as analyses the degree to which drivers are influencing the global market. In the final section of the report, a competitive landscape has been included to provide report audiences with a dashboard view. Key categories of providers covered in the report are D-Mannose’s key players of the global D-Mannose market. Detailed profiles of the providers are also included in the scope of the report to evaluate their long-term and short-term strategies, key offerings and recent developments in the D-Mannose space. Key players in the global D-Mannose market includes VWR Corporation, Atrium Innovations Inc, Ferro Pfanstiehl Laboratories, Inc, Now Health Group Incorporation, Hänseler AG, Kyowa Hakko Kirin Co Ltd, E. I. du Pont de Nemours and Company, Bio-Tech Pharmacal Inc., Jarrow Formulas Inc., and Nutraceutical International Corporation. Also, another key feature of this report is the analysis of all key segments in terms of absolute dollar. This is traditionally overlooked while forecasting the market. However, absolute dollar opportunity is critical in assessing the level of opportunity that a provider can look to achieve, as well as to identify potential resources from a sales and delivery perspective in the global D-Mannose market.